We discuss the properties of the differential equation , a.e. on , where , and satisfies the -Carathéodory conditions on for some . A full description of the asymptotic behavior for of functions satisfying the equation a.e. on is given. We also describe the structure of boundary conditions which are necessary and sufficient for to be at least in . As an application of the theory, new existence and/or uniqueness results for solutions of periodic boundary value problems are shown. where , , and the function is defined for a.e. and for all . The above equation is singular at because of the first term in the right-hand side, which is in general unbounded for . In this paper, we will also alow the function to be unbounded or bounded but discontinuous for certain values of the time variable . This form of is motivated by a variety of initial and boundary value problems known from applications and having nonlinear, discontinuous forcing terms, such as electronic devices which are often driven by square waves or more complicated discontinuous inputs. Typically, such problems are modelled by differential equations where has jump discontinuities at a discrete set of points in , compare . 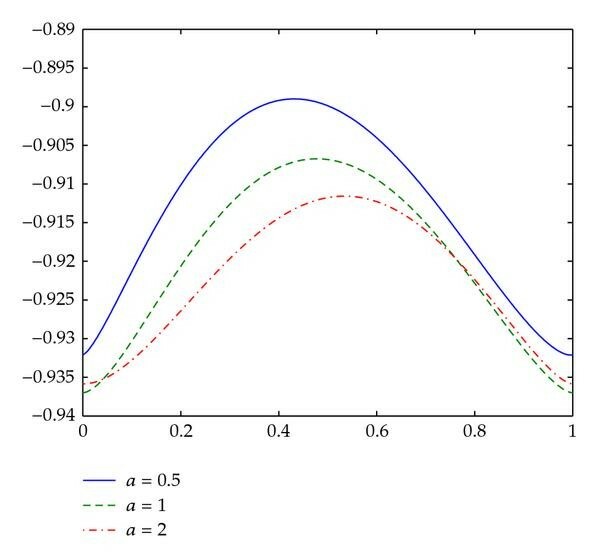 This study serves as a first step toward analysis of more involved nonlinearities, where typically, has singular points also in and . Many applications, compare [2–12], showing these structural difficulties are our main motivation to develop a framework on existence and uniqueness of solutions, their smoothness properties, and the structure of boundary conditions necessary for to have at least continuous first derivative on . Moreover, using new techniques presented in this paper, we would like to extend results from [13, 14] (based on ideas presented in ) where problems of the above form but with appropriately smooth data function have been discussed. Here, we aim at the generalization of the existence and uniqueness assertions derived in those papers for the case of smooth . 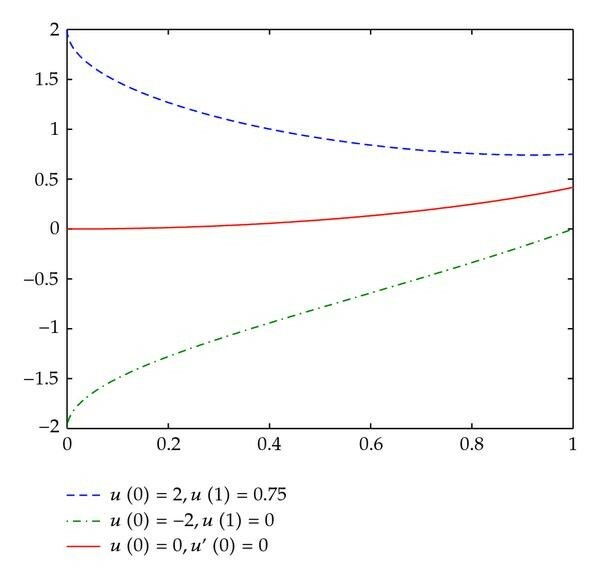 We are especially interested in studying the limit properties of for and the structure of boundary conditions which are necessary and sufficient for to be at least in . where and . Clearly, this means that . From the above remarks, we draw the conclusion that a new approach is necessary to study the analytical properties of (1.1). The following notation will be used throughout the paper. Let be an interval. Then, we denote by the set of functions which are (Lebesgue) integrable on . The corresponding norm is . Let . By , we denote the set of functions whose th powers of modulus are integrable on with the corresponding norm given by . Moreover, let us by and denote the sets of functions being continuous on and having continuous first derivatives on , respectively. The norm on is defined as . Finally, we denote by and the sets of functions which are absolutely continuous on and which have absolutely continuous first derivatives on , respectively. Analogously, and are the sets of functions being absolutely continuous on each compact subinterval and having absolutely continuous first derivatives on each compact subinterval , respectively. specified in the following definition. (iii) for each compact set there exists a function such that for a.e. and all . 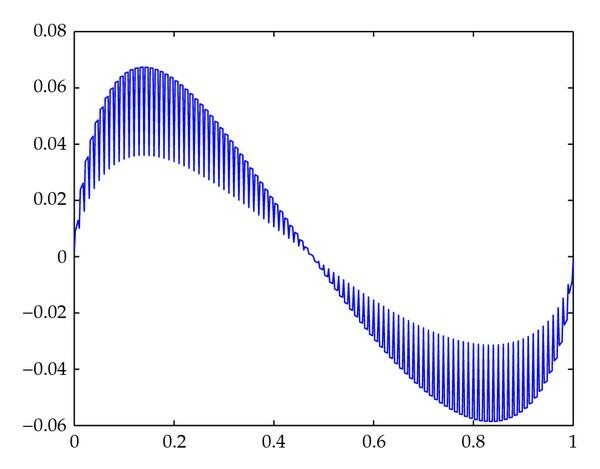 We will provide a full description of the asymptotical behavior for of functions satisfying (2.1) a.e. on . Such functions will be called solutions of (2.1) if they additionally satisfy the smoothness requirement ; see next definition. In Section 3, we consider linear problems and characterize the structure of boundary conditions necessary for the solution to be at least continuous on . These results are modified for nonlinear problems in Section 4. 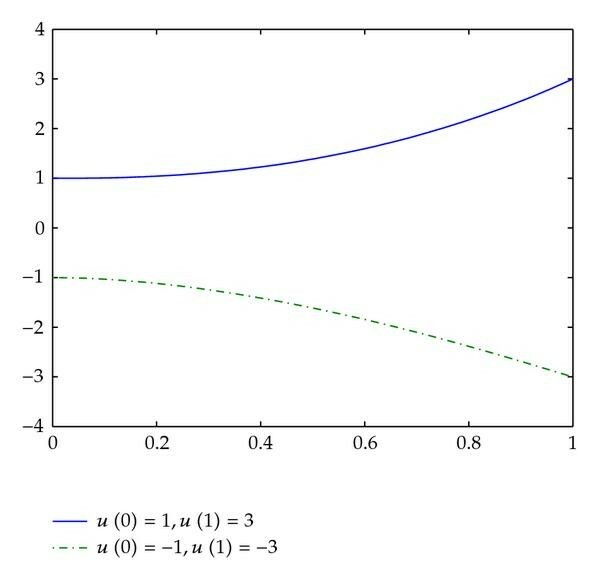 In Section 5, by applying the theory developed in Section 4, we provide new existence and/or uniqueness results for solutions of singular boundary value problems (2.1) with periodic boundary conditions. Now, let , . Without loss of generality, we may assume that . For , we choose , and we have and . which means that . We now use the properties of to represent all functions satisfying (3.1) a.e. on . Remember that such function does not need to be a solution of (3.1) in the sense of Definition 2.2. Let , , and let be given by (3.2). is the set of all functions satisfying (3.1) a.e. on . Moreover, the function is a particular solution of (3.1) on . Therefore, the first statement follows. Analogous argument yields the second assertion. We stress that by (3.8), the particular solution of (3.1) belongs to . For , we can see from (3.9) that it is useful to find other solution representations which are equivalent to (3.10) and (3.11), but use instead of , if . Let and let be given by (3.2). of (3.1) for satisfies . Main results for the linear singular equation (3.1) are now formulated in the following theorems. Moreover, can be extended to the whole interval in such a way that . Therefore , and consequently . where are real matrices, and is an arbitrary vector. Then the following result follows immediately from Theorem 3.3.
into the boundary conditions (3.26b). In particular, can be extended to the whole interval with if and only if . where are real constants. Then the following result follows immediately from Theorem 3.5. Let , . Then for any and any there exists a unique solution of the boundary value problem (3.38a) and (3.38b) if and only if . into the boundary conditions (3.38b). 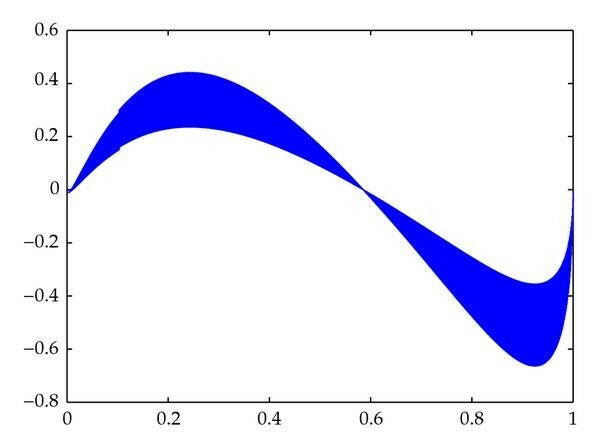 To illustrate the solution behaviour, described by Theorems 3.3 and 3.5, we have carried out a series of numerical calculations on a MATLAB software package bvpsuite designed to solve boundary value problems in ordinary differential equations. The solver is based on a collocation method with Gaussian collocation points. A short description of the code can be found in . This software has already been used for a variety of singular boundary value problems relevant for applications; see, for example, . subject to initial or boundary conditions specified in the following graphs. All solutions were computed on the unit interval . Finally, we expect , and therefore we solve (3.41) subject to the terminal conditions . See Figures 1, 2, and 3. Illustrating Theorem 3. 3: solutions of differential equation (3.41) with , subject to boundary conditions . See graph legend for the values of and . According to Theorem 3.3 it holds that for each choice of and . Illustrating Theorem 3. 5 for : solutions of differential equation (3.41) with , subject to boundary conditions . See graph legend for the values of and . According to Theorem 3.5 a solution satisfies or or in dependence of values and . In order to precisely recover a solution satisfying , the respective simulation was carried out as an initial value problem with and . Illustrating Theorem 3. 5 for : solutions of differential equation (3.41) with , subject to boundary conditions . See graph legend for the values of and . Here, , and , or , . In this section we assume that the function satisfying differential equation (2.1) a.e. on is given. The first derivative of such a function does not need to be continuous at and hence, due to the lack of smoothness, does not need to be a solution of (2.1) in the sense of Definition 2.2. In the following two theorems, we discuss the limit properties of for . and can be extended on in such a way that . Let for a.e. . By (2.2), there exists a function such that for a.e. . Therefore, . Since the equality holds a.e. on , the result follows immediately due to Theorem 3.3. Let be as in the proof of Theorem 4.1. According to Theorem 3.5 and (4.1), satisfies (4.3) both for and . Results derived in Theorems 4.1 and 4.2 constitute a useful tool when investigating the solvability of nonlinear singular equations subject to different types of boundary conditions. In this section, we utilize Theorem 4.1 to show the existence of solutions for periodic problems. The rest of this section is devoted to the numerical simulation of such problems. A function is called a solution of the boundary value problem (5.1a) and (5.1b), if satisfies equation (5.1a) for a.e. and the periodic boundary conditions (5.1b). and we see that it is singular. Consequently, the assumption of Theorem 3.4 is not satisfied, and the linear periodic problem (3.26b) subject to (5.1b) is not uniquely solvable. However this is not true for nonliner periodic problems. In particular, Theorem 5.6 gives a characterization of a class of nonlinear periodic problems (5.1a) and (5.1b) which have only one solution. We begin the investigation of problem (5.1a) and (5.1b) with a uniqueness result. for a.e. and all . Then problem (5.1a) and (5.1b) has at most one solution. Assume that and have an intersection point, that is, there exists such that . Since and are different, there exists , , such that . Let . We can assume that . (Otherwise we choose .) Then we can find satisfying for and . Let be the first zero of . Then, if we set , we see that satisfies (5.5). Let have no zeros on . Then on , and, due to (5.4), . Since , we can find and such that satisfies (5.5). Let on . By (5.4), , and . We may again assume that . It is possible to find such that , , on . Since , has at least one zero in . If is the first zero of , then satisfies (5.5). Assume that and have no common point, that is, on . We may assume that on . By (5.4), there exists a point satisfying . for a.e. , which is a contradiction to on . Let for some . If , then we can find an interval satisfying (5.5). If and on , then and, by (5.4), , . Hence, there exists an interval satisfying (5.5). To summarize, we have shown that in both, the case of intersecting solutions and and the case of separated and , there exists an interval satisfying (5.5). which contradicts . Consequently, we have shown that , and the result follows. Under the assumptions of Theorem 4.1 any solution of (5.1a) satisfies Therefore, we can investigate (5.1a) subject to the auxiliary conditions (5.10) instead of the equivalent original problem (5.1a) and (5.1b). This change of the problem setting is useful for obtaining of a priori estimates necessary for the application of the Fredholm-type existence theorem (Lemma 5.5) during the proof. Step 1 (existence of auxiliary solutions ). for a.e. . It can be shown that and which satisfy the -Carathéodory conditions on are nondecreasing in their second argument and a.e. on ; see . Therefore, also satisfies the -Carathéodory conditions on , and there exists a function such that for a.e. and all . Since the homogeneous problem , has only the trivial solution, we conclude by the Fredholm-type Existence Theorem (see Lemma 5.5) that there exists a solution of problem (5.21). Step 2 (estimates of ). which contradicts (5.23), and thus on . The inequality on can be proved in a very similar way. Step 3 (estimates of ). Denote . If , then . where is given by (5.15). Therefore . Let . Then there exists such that on , . By (5.12), (5.13), (5.22), (5.28), and , we obtain for a.e. Hence, according to (5.15), we again have . Step 4 (convergence of ). Hence (4.1) is satisfied. Applying Theorem 4.1, we conclude that and . Therefore satisfies the periodic conditions on . Thus is a solution of problem (5.1a) and (5.1b) and on . In order to show the existence of solutions to the periodic boundary value problem (5.1a) and (5.1b), the Fredholm-type Existence Theorem is used, see for example, in [20, Theorem ], [11, Theorem ] or [21, page 25]. For convenience, we provide its simple formulation suitable for our purpose below. Lemma 5.5 (Fredholm-type existence theorem). If we combine Theorems 5.2 and 5.3, we obtain conditions sufficient for the solution of (5.1a) and (5.1b) to be unique. Theorem 5.6 (existence and uniqueness). Let all assumptions of Theorems 5.2 and 5.3 hold. Then problem (5.1a) and (5.1b) has a unique solution . Moreover satisfies (5.14). We now illustrate the above theoretical findings by means of numerical simulations. Figure 4 shows graphs of solutions of problem (5.43), (5.1a). 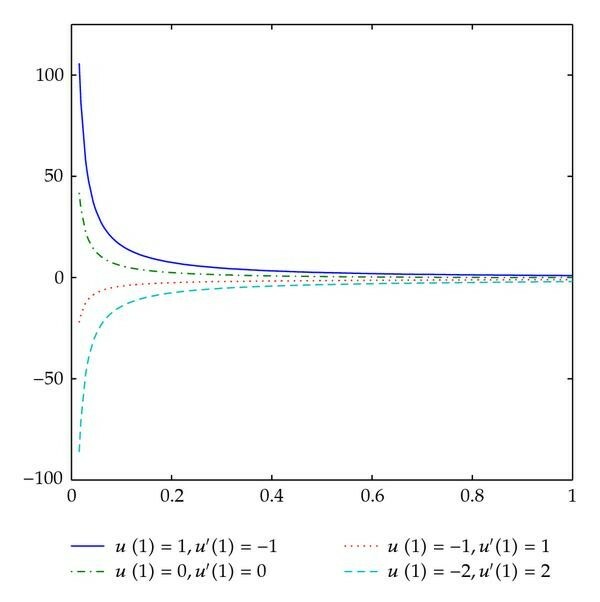 In Figure 5 we display the error estimate for the global error of the numerical solution and the so-called residual (defect) obtained from the substitution of the numerical solution into the differential equation. Both quantities are rather small and indicate that we have found a solution to the analytical problem (5.43)-(5.1a). Illustrating Theorem 5. 6: solutions of differential equation (5.43), subject to periodic boundary conditions (5.1a). See graph legend for the values of . Error estimate (a) and residual (b) for (5. 43)-(5.1a), . We now pose that question about the values of the first derivative at the end points of the interval of integration, and . According to the theory, it holds that . Therefore, we approximate the values of the first derivative of the numerical solution and show these values in Figure 6. One can see that indeed . Also, to support this observation, we plotted in Figure 7 the numerical solutions obtained for the step size tending to zero, or equivalently, grids becoming finer. First derivative of the numerical solution to (5. 43)-(5.1a) with . Numerical solutions of (5. 43)-(5.1a) and in the vicinity of (a) and (b). The step size is decreasing according to . 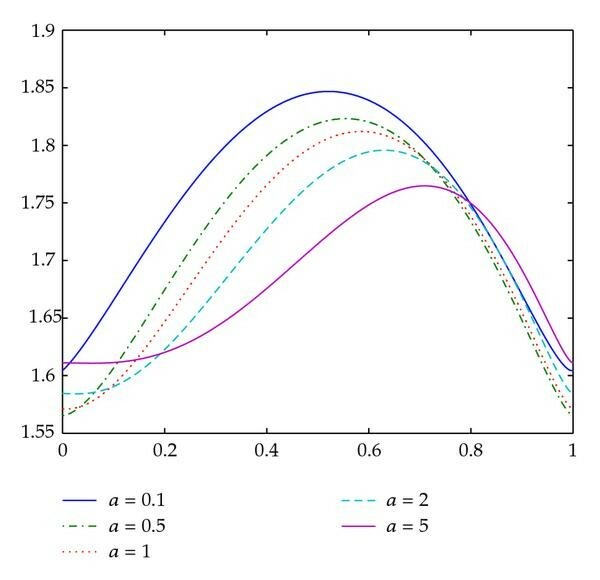 We finally observe experimentally the order of convergence of the numerical method (collocation). Clearly, we do not expect very hight order to hold, since the analytical solution has nonsmooth higher derivatives. However, the method is convergent and, according to Table 1, we observe that its order tends to . Estimated convergence order for the periodic boundary value problem (5.43)-(5.1a) and a = 1. The results of the numerical simulation for the boundary value problem (5.44)-(5.1a), can be found in Figures 8, 9, 10, and 11. Illustrating Theorem 5. 6: solutions of the boundary value problem (5.44)-(5.1a). See graph legend for the values of . Error estimate (a) and residual (b) for (5. 44)-(5.1a), . First derivative of the numerical solution to (5. 44)-(5.1a) with . Numerical solutions of (5. 44)-(5.1a) and in the vicinity of (a) and (b). The step size is decreasing according to . This research was supported by the Council of Czech Goverment MSM6198959214 and by the Grant no. A100190703 of the Grant Agency of the Academy of Sciences of the Czech Republic.